Hoosier Art Salon Founded | Kappa Kappa Kappa, Inc. The Hoosier Art Salon was founded and Tri Kappa presented a prize at the first meeting in Chicago. 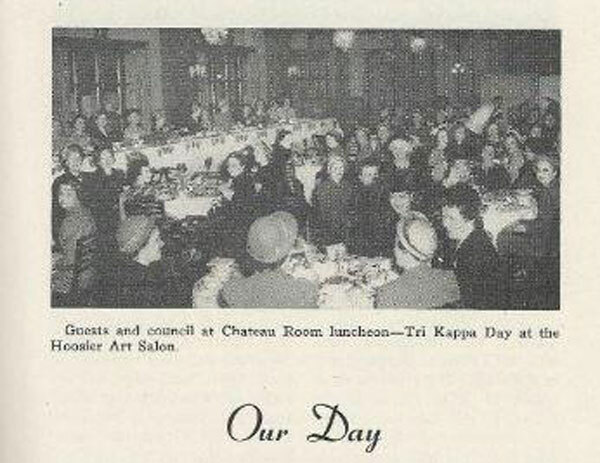 Picture shown is the Third Annual Tri Kappa Day at the Hoosier Art Salon held on February 11, 1950. This luncheon was held in Indianapolis at the Claypool Hotel. Guests of honor were Beryl Showers Holland, founder of Tri Kappa and President of the Hoosier Salon Patrons' Association and Mrs. Leota Loop, Indiana artist.